DIRECTIONS * Apply as needed. Inactive Ingredients: Aloe Barbaden- sis Leaf Extract, Allantoin, Bisabolol, Butyro- spermum (Shea Butter), Caprylyl Glycol, Caprylic/Capric Triglyceride, Cetyl Alcohol, Ceteareth-20, Dimethicone, Eucalyptus Glo- bulus Leaf Oil, Glycerin, 1,2 Hexnediol, Kao- lin Clay, Melaleuca Alternifolia (Tea Tree) Leaf Oil, Neem Oil, Steareth-2, Topical Starch (Cornstarch), Water, Xanthan Gum Zinc Oxide. 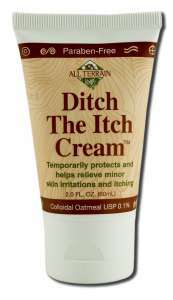 Uses * Temporarily protects and helps to relieve minor skin irritations and itching due to: * rashes * eczema * insect bites * poison ivy, oak, sumac. Warnings: For external use only When using this product * Don't get into eyes. Stop use and ask a doctor if * condition worsens * symptoms last more than 7 days or clear up and return within a few days. Keep out of reach of children. If swallowed, get medical help or contact a Poison Control Center right away.